There aren't many directors in the modern era who can generate a buzz about a new film in the way Tarantino can. Before so much as a frame has been seen, the sense of anticipation starts to build, and then the trailer arrives and the world goes nuts. He's made some duffers over the years, sure, but his reputation as the film geek's geek is unsurpassed. He may not know how to keep a film short, but he knows all the genre conventions and styles for the story he wants to tell. And so it is with Django Unchained. Billed by the man himself as a film about slavery (more of which later), Django Unchained is an open love letter to the Westerns of old, in particular the work of Sam Peckinpah. And, strangely, Mel Brooks. There's also the odd nod or two to Tarantino's first love - 70s martial arts movies. Sometimes the boy just can't help himself. The first hour of this film is a joyous, death-filled romp through the Deep South. Christoph Waltz steals every scene he's in as Schultz, the dentist-turned bounty hunter with a love of admin. From the moment he arrives on his little wagon, you find yourself grinning. He's clearly having a blast with this character, and it spills off the screen in highly infectious waves. Jamie Foxx, meanwhile, is the epitome of cool as Django. He's got the swagger and style of a younger Samuel L Jackson (who himself turns in a stellar performance as the loathsome Stephen later on), and develops brooding menace as Waltz teaches him how to bring in the bad guys. Even Don Johnson's brief appearance as a plantation owner isn't terrible. It's all going swimmingly, in fact. Guns go bang, corpses stack up and the red stuff flies around with all the heft of a disgruntled worker in a Dulux factory. It's not a bad something, don't get me wrong, but there's a clear tonal shift that is so marked it almost makes the large chunk of movie featuring Leonardo Di Caprio's Southern Gentleman Monsieur Candie seem like a different movie. From the violent bounce and oomph of our heroes trekking across Texas, we're suddenly in a dark, menacing, almost Gothic version of Gone With The Wind. Like I said, it's not a bad thing. 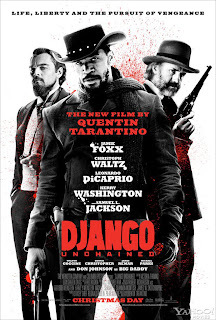 Jackson and Di Caprio (not forgetting the wonderful Kerry Washington as Django's long-lost wife) are excellent, and the sense of fear that runs through the house and staff is palpable. It just feels like a different movie. Fortunately, by the final reel (do they actually have reels anymore? ), the body count is back on the rise and the house looks like DIY SOS went postal with a paint gun. And if the final shoot out and Django's final acts of vengeance don't have you laughing out loud, there's something wrong with you. I just have one slight reservation (and is isn't the running time - this film may be 15mins shy of three hours, but it still felt shorter than the Hobbit), and that's the conversation Tarantino keeps saying we need to have about slavery. He's insistent on this. This is a film about slavery, no one's talking about slavery any more, slavery, slavery, slavery. It's pretty much all he's talked about in all of the interviews I've seen or read. But it's not a film about slavery. It's a love story. Yes Django and Broomhilda are slaves, but this film no more tackles the issues of slavery than David Cameron cares about poor people. To have a discussion about slavery, this film needs to show us things that we don't know about, things the history books don't tell us. But it doesn't. What we learn about slavery is that it's abhorrent, dehumanising, the effect of one race's happiness in oppressing another. None of this is news. Now, a cynic might observe that Django Unchained is up for a couple of Oscars. A cynic might also observe that Lincoln (a film not without its own angle on the slavery story) is also up for a few Oscars. Far be it from me to think that, of course. 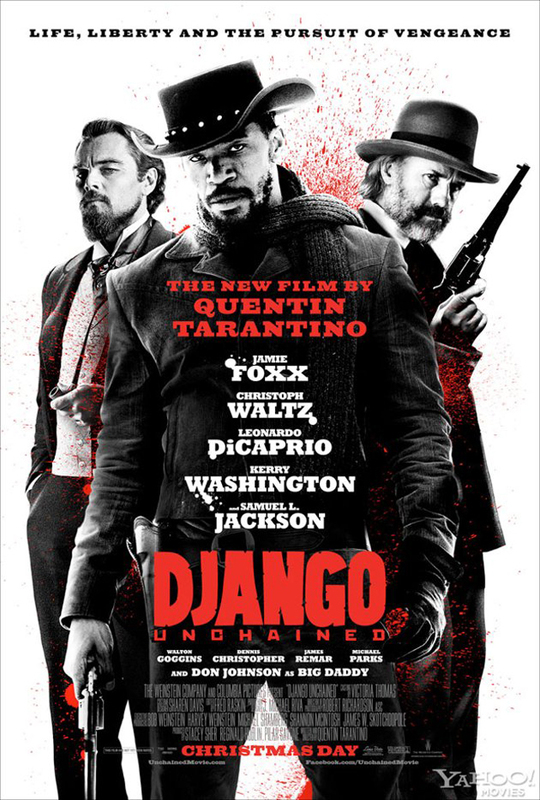 All postulating aside, however, Django Unchained is a quality addition to the Western genre. It wears its heart on its blood-soaked sleeve. The gun fights are gloriously overblown. And the scenery is at times stunning. Just let the film speak for itself.